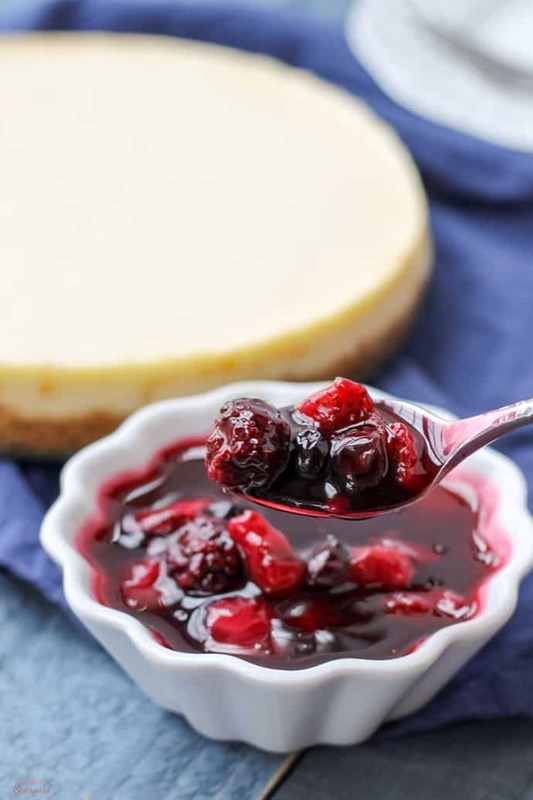 A buttery crust, velvety smooth filling and tart berry topping make this Crockpot Express Cheesecake worthy of any celebration! Never in my life have I had a slice of cheesecake this creamy and delicious. I’ve never actually made a cheesecake because they seem like such a pain. You have to do the whole water bath thing to keep them from cracking, and they still can get dry and gross if you do anything wrong. I think that’s why it’s such a splurge to go to Cheesecake Factory! I had read that pressure cooker cheesecake was amazing, so I was excited to try making my own Crockpot Express Cheesecake. Let me tell you-this does NOT disappoint. The texture is velvety smooth, the flavor is simple and clean and with the Triple Berry Sauce on top, it’s heaven on a plate. Seriously. It’s going on my list of favorite Crockpot Express Recipes. I started with a basic cheesecake recipe that I got from The Electric Pressure Cooker Cookbook. I’ll be sharing a full review of the cookbook next month. So far, it’s been an excellent resource for Crockpot Express cooking! After the cheesecake was done (which, be warned, requires some patience) I made a delicious Triple Berry Sauce for topping. 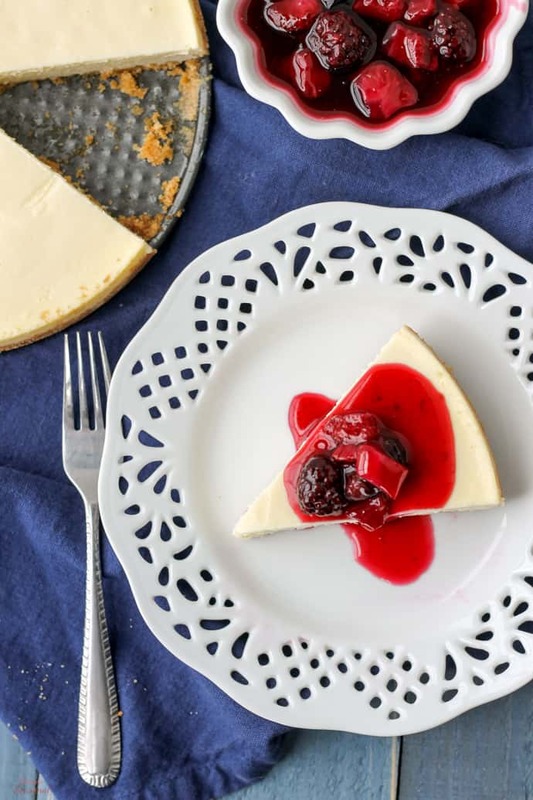 At first glance, the cheesecake looks small, but it’s so rich and satisfying, I found the slices to be just the right size. 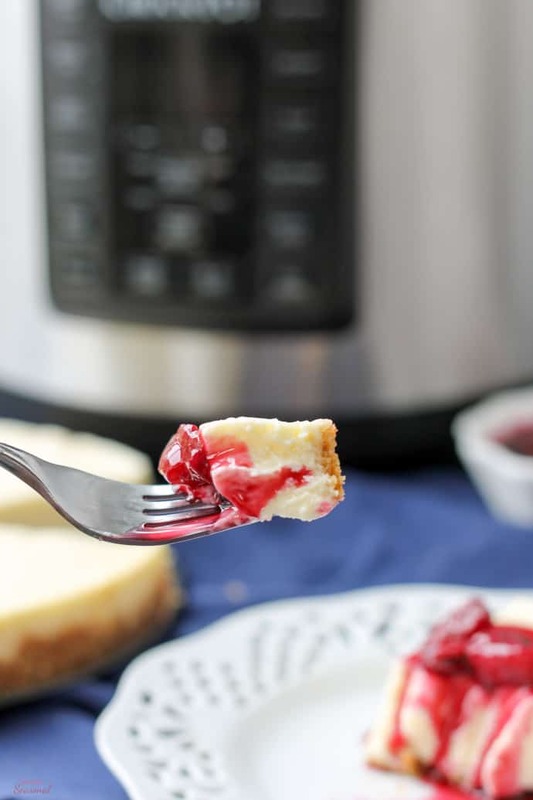 Go ahead and pat yourself on the back when you unlatch the spring form pan and out slides the most beautiful, crack-free Crockpot Express Cheesecake. Go ahead. You’ve earned it. PATIENCE. The cream cheese and eggs must be at room temperature. And no, pulling them out of the fridge for 15 minutes will not cut it. The cream cheese needs to be out of the refrigerator for several hours! Don’t press the crumb crust too high up the sides-you don’t want extra moisture in the crust. The longer the cook time, the more dense the cheesecake (think New York style.) 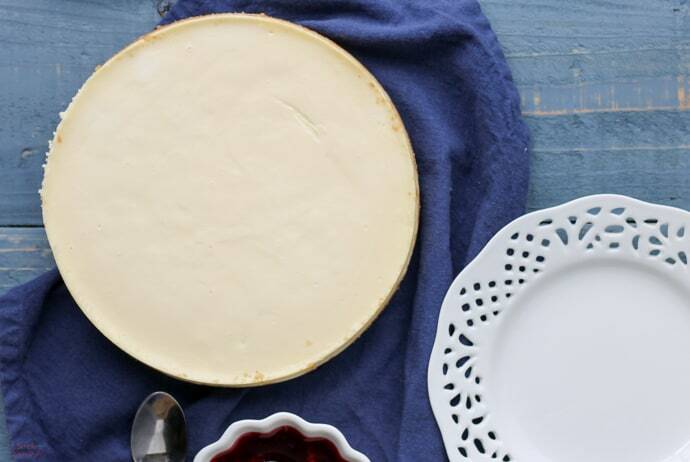 This recipe is written for a creamier cheesecake and made in a 7″ springform pan. Spray a 7" springform pan with nonstick spray. In a small bowl, combine the graham cracker crumbs, sugar and butter. Spread evenly in the bottom of the pan and about 1" up the sides (at the most.) Freeze for 10 minutes. In a large bowl, mix the cream cheese, and sugar at medium speed until smooth. Mix in sour cream, flour, vanilla and salt until just blended. Add the eggs and mix again until just blended. Do not over mix! Pour batter into the crust. In a medium sauce pan, mix cornstarch and cold water. DO NOT HEAT until the corn starch has dissolved. Add the sugar and turn on the heat to medium/high. After one minute, add the fruit and stir to combine. Bring to a boil, then lower the heat to low and simmer for about 10 minutes. Remove from heat and cool to thicken. At first glance, this may seem long and complicated, but I assure it’s not too bad, and it’s completely worth it. 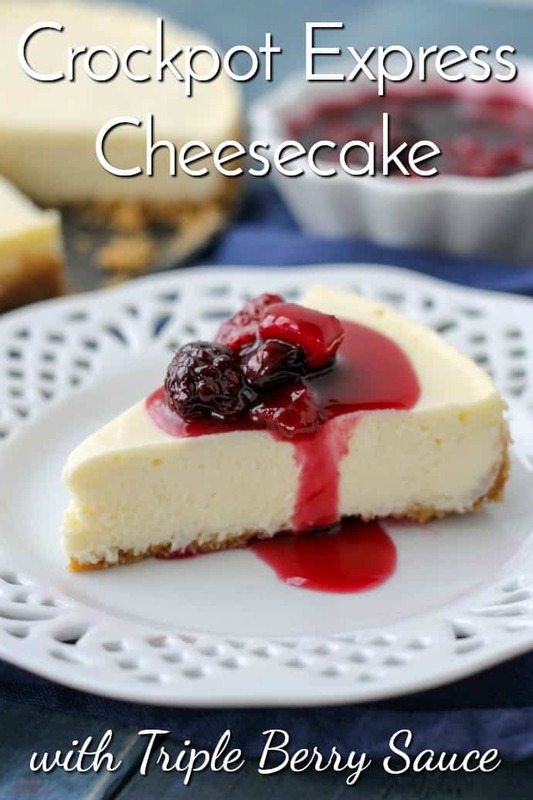 One bite of that creamy deliciousness and you’ll be a fan of Crockpot Express Cheesecake! You can use any leftover Triple Berry Sauce for pancakes, ice cream topping or crepe filling! Don’t forget to check out all my other great Crockpot Express Recipes! Did you cover it with foil? Made this last night. Everyone was wanting to eat it right away, told them it had to wait till today. Flavor is excellent. Very creamy in the middle, which my son-in-law loved. He’s eating his second piece now. I liked the creaminess. The edges are more NY style, which I like. I will definitely be making this again. First dessert in my new toy and it’s a winner. Thank you. Awesome! Yes, it’s so hard to wait, but cheesecake MUST have that chill time. 🙂 You can go with a longer cook time to get the whole thing NY style! Can I make this into a chocolate cheesecake? Do you have any suggestions? Making this today!!! Fingers crossed it works out! I’ve never made a cheesecake let along a desert in the crockpot express. Can’t wait to come back and let you all know how it worked out! Good luck! Be patient-make sure things are room temperature and don’t over-mix 🙂 It’s so yummy! My cheesecake came out looking like a soufle!! I followed the instructions😢😢😢 i don’t know what i did wrong ! Sounds like you over-mixed the batter. That will leave you with a weird, puffy middle that looks a bit like souffle. It tastes OK but doesn’t look as pretty 🙂 Be sure to use a hand mixer and not an electric stand mixer, and just get the ingredients mixed, rather than beating them like you would a cake. Then you also need to spend the time tapping out the air bubbles. Better luck next time! This looks wonderful. I have made a cheesecake in my Instant Pot but it does not come out smooth like yours. So I am asking if your recipe would apply exactly as is to the Instant Pot? Same settings, the bean setting? Love your site….Thanks. I personally haven’t tested this recipe in the Instant Pot, but there are plenty of people who have, so I feel safe in saying that it would be the same. For the IP, you could just use the manual button. As long as it’s the same pressure/time, you should be fine. 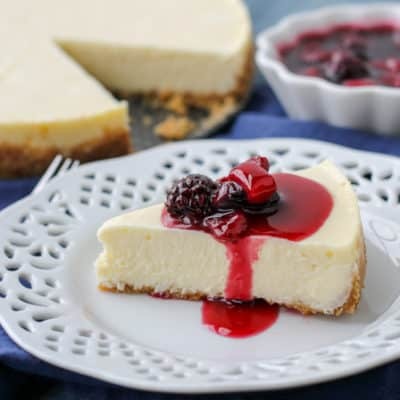 Be sure to follow the tips for a creamy cheesecake, as well- ESPECIALLY letting the cream cheese get all the way to room temperature. Pull it out for several hours. It makes a huge difference.